Developers Jelena Jovanovic (from left) and Christoph Kohstall and Intel Corp. CEO Brian Krzanich watch the Nixie wearable drone camera at the International Consumer Electronics Show in Las Vegas. The International Consumer Electronics Show came to a close Friday in Las Vegas — and with it: the end of a performance. The show is meant to be a happy time: party hard. Put your best face forward — even if you're not sure about the future of your company. The CEO of Intel, the chipmaker, is in just that awkward position. On stage at the Venetian hotel, a pop band and a cellist play a rendition of the song "Radioactive." The combination of modern and classical form, the refrain "Welcome to the new age, to the new age" — it was a fitting prelude to the real show. The tens of thousands of people at the week-long show didn't come for the musicians. They came to this gadget-fest for the engineers, for people like Intel CEO Brian Krzanich, who was the opening night headliner. As Krzanich stepped on stage, the audience expected to be dazzled. And he dazzled them with Nixie, which he called "the first wearable camera that can fly." The must-have drone has legs that fold around your wrist like a watchband. And when you want that selfie from the sky, unclasp it and it can hover around you to shoot. "Now those of you in the audience," Krzanich says, "Get your cameras ready — we're about to witness history." 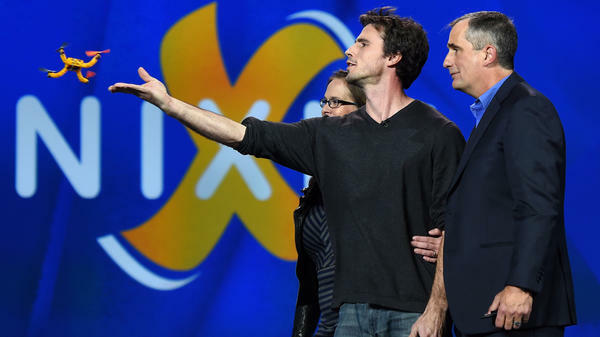 We watch Nixie take the first flying photo on the stage of this electronics show – and it's made possible by an Intel chip. For an hour, Krzanich uses whiz-bang technology to make a case: Just like Google is the software platform for developers around the world, Intel — the chipmaker — is the hardware platform. From drones to refrigerators to bracelets — if it computes, if it's smart, if it needs to communicate — it should be done with Intel inside. At least, that's the hope. A Comeback — With Wearable Devices? "It's a hard slog," says Michael Malone. "It can look like your divorced uncle going out dancing on a Friday night." Malone, the author of the book The Intel Trinity, says the company founded in 1968 fell behind the smartphone revolution and poured its money into making big chips for more intelligent PCs and servers. "That was a fairly reasonable conclusion to draw," Malone says. "However, it was the wrong one." Intel is now betting on the wearable device movement — like that wearable drone — even though it might flop. And according to research sponsored by Intel, customers are not sold. But, Malone says, Intel has to show the world that the company's in the game: "They're not stodgy old Intel. They're making connections with a lot of interesting folks that are doing interesting things." Off stage, CEO Krzanich talks about the new kinds of companies he's working with in this wearable era. Take the fashion industry: "They're used to changing product right up until the last moment, as fashion and what's desirable shifts. And that's something we've had to adapt to." Brands like Oakley sunglasses and Fossil watches are really different from the old PC makers — and from each other. And, Krzanich admits, he's not into the scene per se. "I can't say I went to any of the parties," he says about his time at New York Fashion Week. "An engineer at fashion week. It's not the exciting thing. It's not like a tech show." Intel has a real technology challenge: to figure out a button-sized superchip that'll serve the needs of many new, fragmented partners. Krzanich unveiled a prototype called Curie, which does not yet have a price. Intel's got to get the price right. Back in the PC era, it sold chips for as much as $1,000 — and had nice margins. But when I roam this convention floor and ask device-makers what they'd pay for a quality chip, I get single-digit answers: mostly $1 or $2. Mark Watterson with iFit.com says he'd go as high as $6. "The current chips on the market are limiting" his smartwatches and smart shoes, he says. But an expensive chip would have to be "good." Intel's chips — which are more than good — might be overkill. And so, as CEO Krzanich walks passed poker tables to lead Intel demos, he is making a gamble. The International Consumer Electronics Show came to close yesterday in Las Vegas. The show is a show, meant to be a happy time - part business, part performance, lots of partying. And it's a time to put on a good show, even if you're not certain about the future of your company. The CEO of Intel, the chipmaker, is in exactly that awkward position. NPR's Aarti Shahani takes a look at why. IMAGINE DRAGONS: (Singing) Welcome to the new age, to the new age. AARTI SHAHANI, BYLINE: It's show time. Only at this week-long gadget fest the musicians aren't the rage, the engineers are. SHAHANI: The opening night headliner is the CEO of Intel Corporation. SHAHANI: A man named Brian Krzanich. Tens of thousands of people expect to be dazzled and Krzanich steps up to dazzle us with this. BRIAN KRZANICH: Nixie, the first wearable camera that can fly. SHAHANI: Meet Nixie, the must-have drone whose legs can fold around your wrist like a watchband. And when you want that selfie from the sky, unclasp it so it can hover around you and shoot. KRZANICH: Now, those of you in the audience, get your cameras ready because we're about to witness history here. SHAHANI: We watched Nixie take the first-ever flying photo on the stage of this electronics show. And it's made possible by an Intel chip. UNIDENTIFIED MAN #2: OK, let her go. SHAHANI: For an hour Krzanich uses whiz-bangy technology to make a case - just like Google is the software platform for developers around the world, Intel - the chipmaker - is the hardware platform. From drones to refrigerators to bracelets, if it computes, if it's smart, if it needs to communicate, it should be done with Intel inside. At least, that's the hope. MICHAEL MALONE: It's a hard slog and it can look like your divorced uncle going out dancing on a Friday night. SHAHANI: Michael Malone is author of the book "The Intel Trinity." MALONE: This is a 50-year-old company, or a 45-year-old company, trying to look young again. SHAHANI: Intel fell behind the smartphone revolution. It's now betting on the wearable device movement, like the drone watch, even though it might flop. And according to research sponsored by Intel, customers are not sold, but Malone says Intel has to show the world that it's trying. MALONE: And they're not stodgy old Intel. You know, they're making connections with a lot of interesting folks that are doing interesting things. KRZANICH: The fashion industry works very different than the classic tech industry. SHAHANI: That's the CEO, Brian Krzanich, talking to me off stage about the companies he's working with in this wearable era. KRZANICH: They're used to changing product right up until the last moment as fashion and what's desirable shifts, and that's something we've had to adapt to. SHAHANI: Brands like Oakley sunglasses and Fossil watches are really different from the old PC makers and from each other. Even if Intel could figure out a button-sized superchip to serve every partner's needs, they've still got to get the price right. Back in the PC era, Intel sold chips for as much as a thousand dollars and had nice margins. But when I roam this convention floor and ask device-makers what they'd pay for a quality chip, I get single-digit answers. UNIDENTIFIED MAN #3: Under a dollar. UNIDENTIFIED MAN #4: If it's dollar, two dollars. UNIDENTIFIED MAN #5: A couple dollars, you know, $5-$6 for a good chip on that. SHAHANI: Intel chips, which are more than good, might be overkill. And so, as CEO Krzanich walks past poker tables to lead Intel demos, he himself is making a gamble. Aarti Shahani, NPR News, Las Vegas. Transcript provided by NPR, Copyright NPR.